Attractions like Parc Aventura Brasov and Dino Parc make great kid-friendly stops. 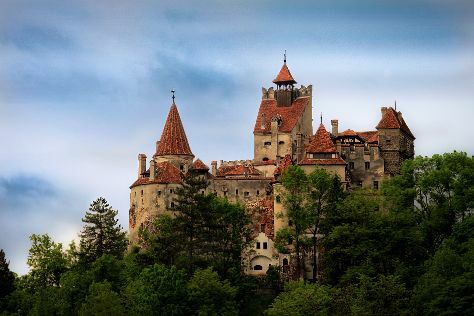 Explore Brasov's surroundings by going to Peles Castle (in Sinaia), Bran Castle (Dracula's Castle) (in Bran) and La Prapastii Zarnesti (in Zarnesti). There's still lots to do: contemplate in the serene atmosphere at Black Church (Biserica Neagra), pause for some serene contemplation at Catedrala Ortodoxa Adormirea Maicii Domnului, look for gifts at Barrique M, and explore the historical opulence of Rasnov Citadel. For traveler tips, other places to visit, maps, and more tourist information, read Brasov tour app . Cairo, Egypt to Brasov is an approximately 9.5-hour combination of flight and shuttle. You can also do a combination of flight and train; or drive. Finish your sightseeing early on the 18th (Sat) so you can drive to Tulcea. Tulcea is a city in Dobrogea, Romania. On the 19th (Sun), pause for some photo ops at Monumentul Independentei, then examine the collection at The Danube Delta Museum, then explore the world behind art at Muzeul de Etnografie Si Arta Populara - Tulcea / Ethnographic and Folk Art Museum - Tulcea, and finally look for all kinds of wild species at Danube Delta Biosphere Reserve. To see maps, ratings, and other tourist information, use the Tulcea trip planning app . Traveling by car from Brasov to Tulcea takes 6 hours. Alternatively, you can do a combination of train and bus; or take a bus. In May, plan for daily highs up to 27°C, and evening lows to 13°C. Wrap up your sightseeing on the 19th (Sun) early enough to drive to Bucharest. When in Bucharest, make a side trip to see Therme București in Balotesti, approximately 36 minutes away. There's much more to do: admire the striking features of Palace of Parliament, admire the natural beauty at Cismigiu Gardens, take in the architecture and atmosphere at Stavropoleos Church (Biserica Stravrapoleos), and test your problem-solving skills at popular escape rooms. To find maps, other places to visit, ratings, and more tourist information, refer to the Bucharest trip tool . Getting from Tulcea to Bucharest by car takes about 3.5 hours. Other options: take a bus; or take a train. In May, plan for daily highs up to 27°C, and evening lows to 11°C. Finish up your sightseeing early on the 22nd (Wed) so you can travel back home.